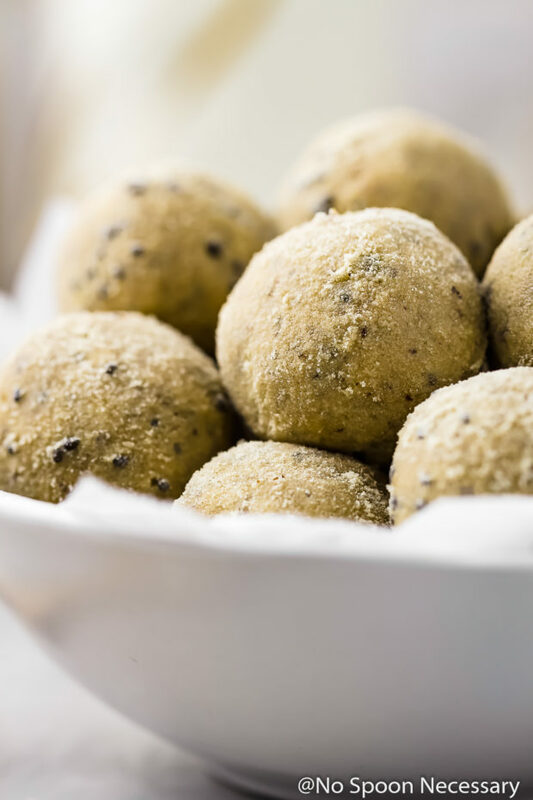 Quick and easy homemade energy bites. Soft, chewy and deliciously packed with protein, fiber and nutrients, these No Bake Honey Nut Vanilla Protein Energy Bites only require 6 ingredients and are perfect for snacking on the go! This post was originally published in June 2017. 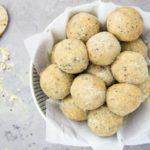 I edited the photos and updated the post below to include more information about these protein balls. Plus, I added a recipe video to show you how easy these vanilla energy bites are to make! T-minus NINE days until the official start of summer! I’m not sure if that deserves a ‘woot-woot’ or a ‘wooomp-womp’. I’ll be brazen and say it deserves a little bit of both. I mean, so much YESSSS to lounging poolside, frolicking by the ocean and soaking up the summer sun! 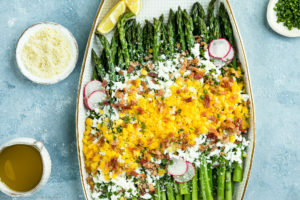 Well, since you just can’t have summer without all the snacking, and without itsy bitsy teenie weenie yellow polka-dot bikinis, today we are going to bust out some homemade bites perfect for both the season and your waistline! … actually, make that EASY Homemade Honey Nut Vanilla NO BAKE Protein Bites. These bodacious bites are soft, yet dense and chewy with a marvelous melt in your mouth feel. 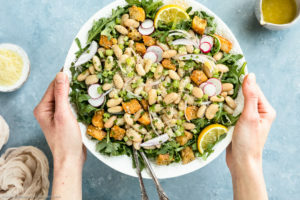 Plus they are LOADED with all the flava – think smooth vanilla, salty nuts, creamy peanut butter and subtly sweet honey – and PACKED with protein and fiber, which makes these bites perfect for when hunger strikes. ⬆️ Because being hangry is never a good look. 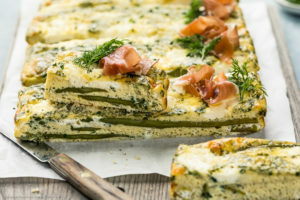 Did I mention these bites are PACKED with protein? I’m talking, jam-up jelly-tight PACKED with PROTEIN. Not only do you get protein from the nuts, but you also get a huge BOOST of protein power from the protein powder. 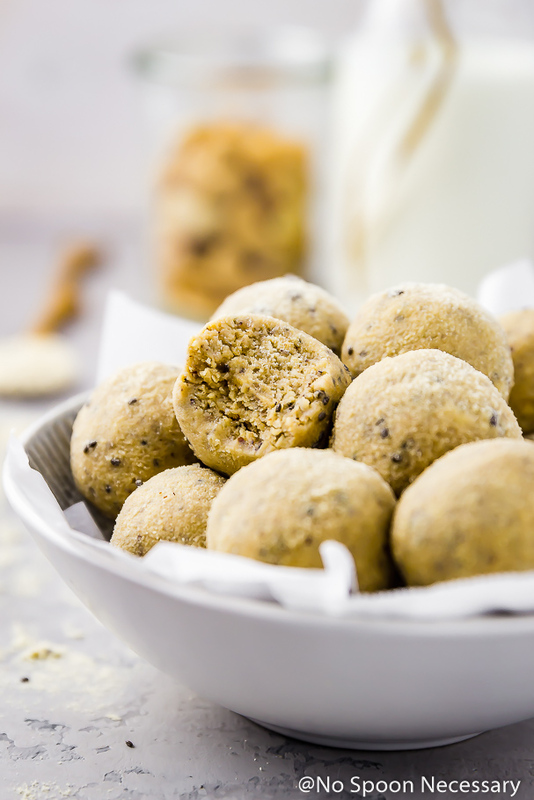 And, if all the deliciousness that is these little balls of YUM wasn’t enough, these Honey Nut Vanilla Protein Energy Bites are also a CINCH to throw together. NO baking, NO whisking, NO stand-mixing. Just you, a food processor, 6 ingredients and some good ole fashioned rolling with your hands. 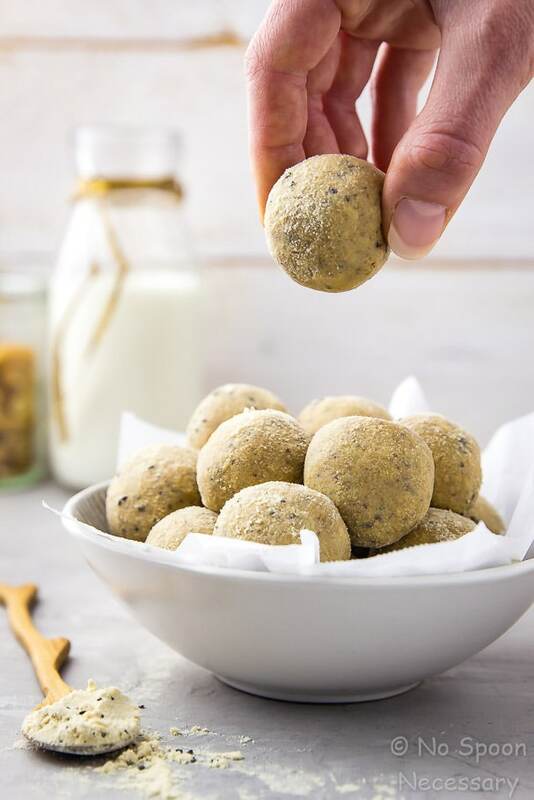 Energy bites, also called energy balls, protein balls or protein bites are a nutrient packed snack that provide tons of protein and sustained energy. Energy bites are chewy in texture and taste like a treat minus all the added sugar and guilt! How many calories are energy bites? The number of calories in an energy bite will vary greatly depending on the ingredients used in the recipe. These Vanilla Protein Energy Bites are 96 calories per serving. How to store energy bites? Energy bites should be stored in an air-tight container in the refrigerator or freezer. How long do energy bites keep? How long do energy bites last? Properly stored energy bites will keep in an air-tight container in the refrigerator for up to 1 week. Can energy bites be frozen? How to freeze energy bites? Energy bites can absolutely be frozen! To freeze energy bites, place them in an air-tight container and store in the freezer for up to 3 months. How to make no bake energy bites? Pulse some cashews in a food processor until they resemble coarse sand. 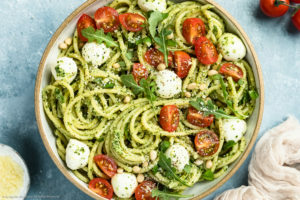 Mix the cashews together with a handful of hazelnut meal, a scoop of peanut butter, a generous amount of Bob’s Red Mill Vanilla Protein Powder, a drizzle of honey and a few drops of vanilla extract. 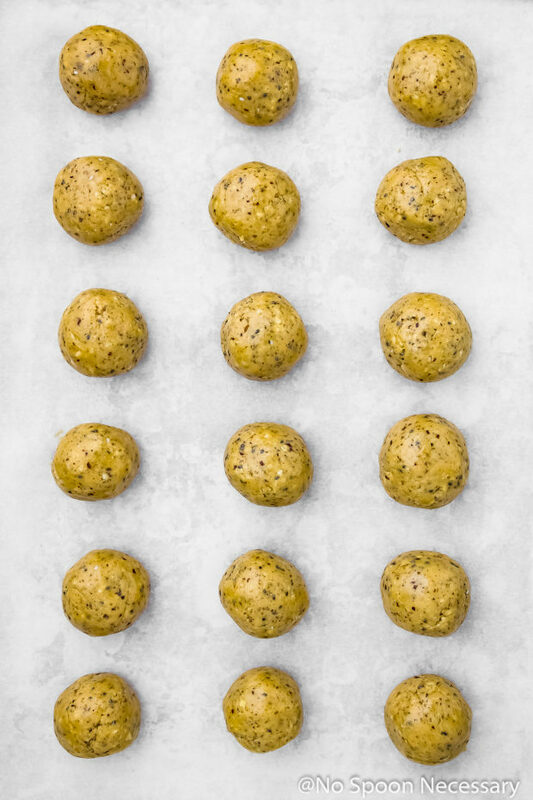 Use your hands to roll the mixture into 1’’ balls and place them on a cookie tray lined with parchment paper. Park the energy bites in the freezer for 20 minutes. Take them out and lightly roll the bites in some more Bob’s Red Mill Vanilla Protein Powder. DEVOUR. Easy peasy protein squeeze-y! 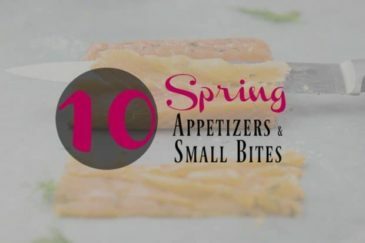 These bites are highly customizable, so I encourage you to make these your own! If you aren’t a fan of cashews, you can substitute any nut you would like. Hazelnuts, almonds, or peanuts would all be delicious. 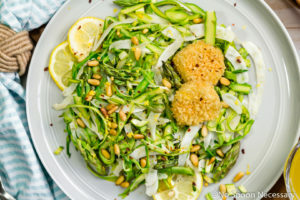 While the recipe calls for hazelnut meal, I have used almond meal before and it is just as delightful! 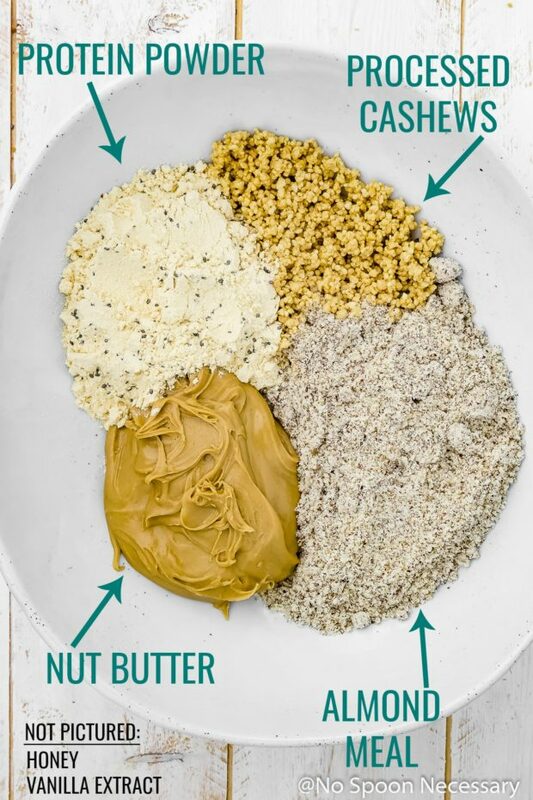 You can substitute any nut butter for the peanut butter, just make sure it is creamy and the no-stir variety. If you are vegan, feel free to substitute maple syrup for the honey! 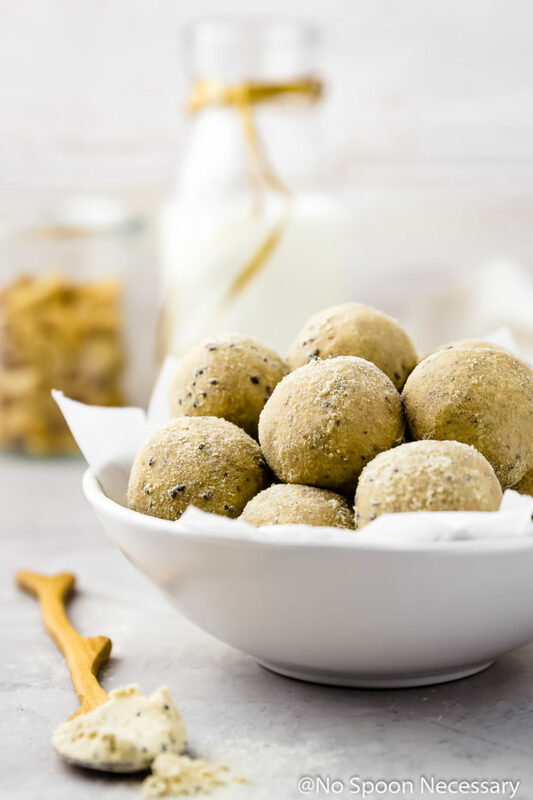 Healthy, delicious and packed with nourishing goodies, these Honey Nut Vanilla Protein Energy Bites are a snack you can feel GOOD about eating. Until Thursday friends, cheers – to gettin’ your healthy summer snack on! Quick and easy homemade energy bites. Soft, chewy and deliciously packed with protein, fiber and nutrients, these No Bake Honey Nut Vanilla Protein Bites are perfect for snacking on the go! In the bowl of a food processor, add the cashews and pulse to finely chop. The cashews should resemble coarse flour. 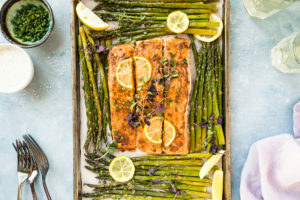 Line a small baking sheet or plate with parchment paper and set aside. In a large bowl mix together the finely chopped cashews with the almond meal, peanut butter, and protein powder. Add in the vanilla extract and honey and use your hands to mix well. Use your hands and scoop out about 1 tablespoon of the mixture. Roll into a ball (should be about 1-1 ½’’) and place on prepared baking sheet. Repeat rolling until all the mixture is used. Transfer the baking sheet to the freezer and freeze for 20 minutes. 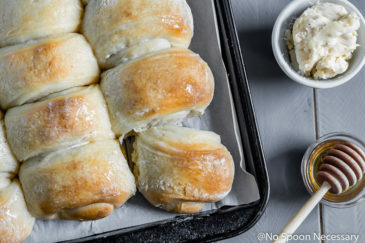 Lightly roll the protein bites in more vanilla protein powder. Eat or store in an air-tight container the refrigerator for up to 1 week or the freezer for up to 3 months. Enjoy! You can substitute any nut butter for the peanut butter, just make sure it is creamy and the no-stir variety. I used reduced fat peanut butter. I remember these little bites Chey! Always great to have a batch on hand for a busy week for that quick little boost of energy! The perfect little on the go snack and pick me up! These look delicious and packed full of protein and energy for a mid-day pick me up! Sign me up to give these a try! WOW these make such an amazingly delicious snack. I love that it is a no bake as well. oh these look delicious. 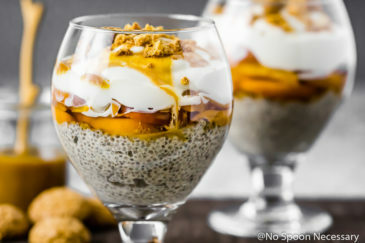 and i love the idea of having energy snacks around with chia seeds. smart choices! I seriously need to keep a batch of these at my desk at work!! I’m basically hungry nonstop throughout the day and would love to just pop one of these in my mouth whenever hunger hits! Then my stomach wouldn’t growl so awkwardly in the middle of meetings lol. I love the idea of honey nut vanilla flavor!! I love energy balls like this! They have saved my life many a time when dinner is still hours away. These look incredible! It’s definitely more of a womp womp bathing suit season over here my friend. 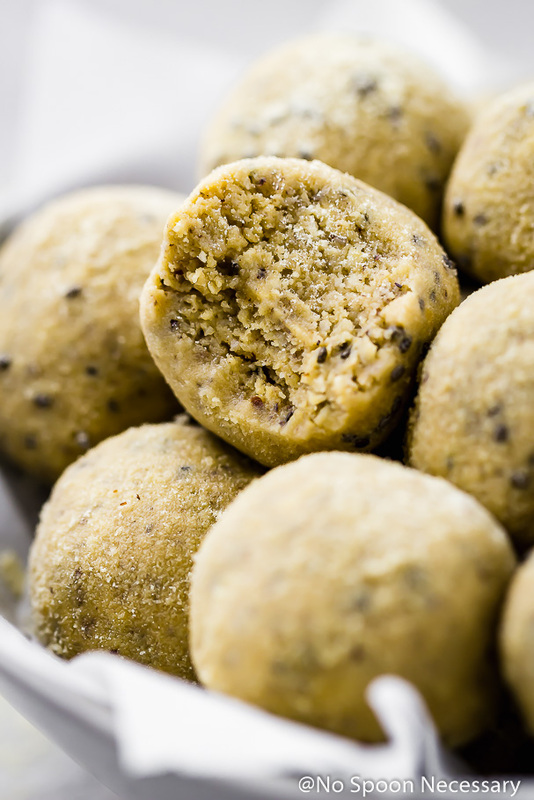 I need these protein bites in my life stat. They can keep me out of the Walgreens candy aisle and save me (and my colleagues) safe from burst of hangry if I have these little snacks at my desk! I love these! I need all the energy I can get, especially in the afternoon. I might eat the whole bowl though! 🙂 Take care. Yay for the summer and the bikini season. 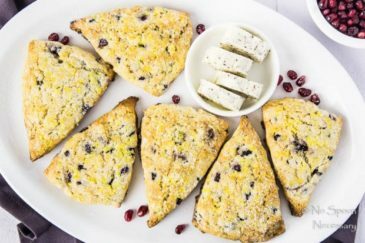 I love to make and eat energy bites, and I so want to grab a few to these protein bars through my computer screen. The texture looks just so good, soft and chewy, Cheyanne. The addition of vanilla protein powder sounds fantastic.